You know the idiom – There’s more than one way to skin a cat? Well, if you really look at it, there isn’t many ways to build a house. Home construction isn’t like cat skinning – you basically put up the four walls then slap on a roof. Viola! But as everything around us has changed or modernised over the years, this age-old method of home construction also needs to change with the times…don’t you think? Well, technology has already lent a hand in this change. The most modern of them all is actually what was revealed last week at the South by Southwest festival in Austin, Texas. 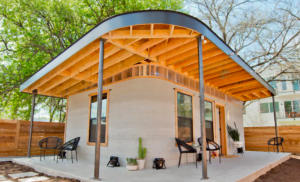 A construction technologies startup company called ICON and housing nonprofit New Story unveiled their version of a 3D printed house. The model is 650 square feet and consists of a living room, kitchen, bedroom, bathroom, and shaded porch. It went from zero to finished in under 24 hours, and it cost less than USD10,000. That’s cheaper than buying a MYVI in Malaysia. I believe that this technology is also being adopted at El-Salvador to build a township to house an entire community. The target for this development is to make each house ultimately affordable at below USD4,000 each. This is basically the price of 1 month’s rental of a high-end semi-dee here in Malaysia. The main idea of this El-Salvador project is very noble, the developer wants to make sure people without homes (who have never had a space to call their own) to be able to finally have one. What are 3D Printed homes? This 3D printed house is cheaper than a Perodua MyVi in Malaysia. With 3D printing, you not only have a continuous thermal envelope, high thermal mass, and near zero-waste, but you also have speed, a much broader design palette, next-level resiliency, and the possibility of a quantum leap in affordability. Do we have such technology in Malaysia? Well, we do not have 3D home printing yet, though I feel that it is just a matter of time before it reaches our shores, as before US, 3D house printing was already introduced in Russia, Dubai and Amsterdam. Gamuda IBS was the first to house a digital IBS facility in Sepang. However, in Malaysia, thanks to Gamuda IBS, who was the first to house a digital IBS facility in Sepang, we have the next stage of construction introduced to our shores. Leveraging on today’s digital design tools and robotic construction, digital IBS means flexibility in design, fast construction and superior quality finish. IBS may not be 3D Printing of homes but it sure looks like a promising solution for affordable homes, here in Malaysia. Industrialised building system (IBS) is a term used in Malaysia for a technique of construction where by components are manufactured in a controlled environment, either at site or off site, placed and assembled into construction works – pretty much like a Lego set. Worldwide, IBS is also known as Pre-fabricated/Pre-fab Construction, Modern Method of Construction (MMC) and Off-site Construction. Digital IBS further enhances labour reduction compared to conventional precast as it replaces humans with robots for most of its workmanship, and utilise digital design tools very similar to 3D printing. Recently, I have witnessed two launches where Gamuda IBS had been awarded the construction using Digital IBS – one of these projects was handed over to buyers more than 12 months in advance at really affordable rates of only RM42,000 to RM250,000. While the other project was recently opened for registration, also selling at very affordable rates. Now, I believe many of you would be thinking (since I mentioned Lego blocks earlier) that homes constructed with Digital IBS would all be chalk-a-block standard designs – well no. Digital IBS allows for customisation; hence it has a more modern approach, making the quality of homes and its finishing really top-notch. Why IBS and not 3D printing yet? 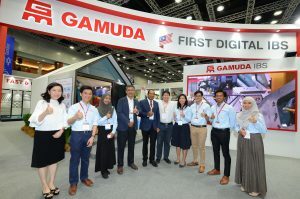 Well, when I spoke with Tan Ek Khai, who is the General Manager, Gamuda IBS, his explanation was simple and apt – digital IBS has the flexibility to customise anything landed and high-rise, especially when it comes to more than 15-storey buildings which is hard to do with 3D printing, which is mainly used for individual small landed units. So why hasn’t IBS been accepted by all developers at the moment? Well, what we actually do not know is that, as of mid 2016, about 69% of government projects adopted IBS, while the adoption rate among the private sector stood at under 15%. Now in 2019, more developers are looking at joining the bandwagon as Malaysian’s are really suffering without an actual solution to the two-decade old issue of affordable housing. While 3D home printing may seem like the real solution to the affordable housing dilemma, IBS may be the stage in between traditional construction and 3D home printing, paving the path for quicker construction with great quality and genuine affordable rates. My honest opinion is that every developer should work with players like Gamuda IBS to ensure that the Government’s aspiration of building 100,000 units of affordable houses per year is met.